The SBAI was set up to monitor conformity to the “Standards for Alternative Investments” (the Standards). The Standards are a set of voluntary standards drawn up by the Alternative Investment industry with conformity through a “comply or explain” regime. A manager who becomes a “signatory” to the Standards “conforms” to the Standards or explains that it will not comply within a disclosure statement. North Asset Management complies with all the Standards; further details about the SBAI can be found on the SBAI website at www.sbai.org. No responsibility, duty of care or liability whatsoever (whether in contract or tort or otherwise including, but not limited to, negligence) is or will be accepted by the Standards Board for Alternative Investments Limited ("SBAI") or the Board of Trustees of the SBAI, any member of the SBAI's Investor Chapter (each an “Investor Chapter Member”) or a Core Supporter of the SBAU to Signatories, investors or any other person in connection with the Standards or any Conformity Statement or Disclosure Statement made by any Signatory. A Core Supporter can be a Signatory to the Standards, a member of the SBAI's Investor Chapter or an investment consultant. Neither the SBAI nor its Board of Trustees is a regulator of the alternative investment industry and their role does not extend beyond being a custodian of the Standards. None of the SBAI, its Board of Trustees, the Investor Chapter Members and the Core Supporters will seek to enforce compliance with the Standards by Signatories. The fact that a manager is a Signatory to the Standards is not and should not be taken as an endorsement of such manager by the SBAI, the Board of Trustees, any Investor Chapter Member or any Core Supporter or as a representation by the SBAI, the Board of Trustees, any Investor Chapter Member or any other Core Supporter that such Signatory operates in conformity with the Standards. In determining whether to accept a manager's application to become a Signatory (or whether to revoke a manager's status as a signatory), the Board of Trustees is entitled to rely on the information provided to it by such manager without further investigation or verification. Further, subject to any duties a Trustee may have under applicable law, it is not envisaged, or expected, that a Trustee will when participating in any such decision of the Board of Trustees take into consideration information which it may possess otherwise than in its capacity as a Trustee. For the avoidance of doubt, Trustees act as individuals. 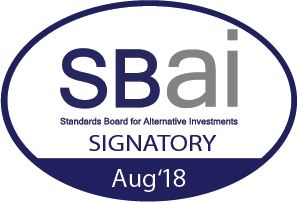 None of the SBAI, the Board of Trustees of the SBAI, the Investor Chapter Members and the other Core Supporters accept any responsibility or liability for any loss or damage caused to any person who acts or refrains from acting as a result of anything contained in or omitted from the Standards or any Conformity Statement or Disclosure Statement made by any Signatory or in reliance on the provisions of or material in the Standards or any Conformity Statement or Disclosure Statement made by any Signatory, whether such loss or damage is caused by negligence or otherwise.